Warning #1: all lists are subjective. Warning #2: lists about New York City are more subjective than most. So, unless you’re a 37-year-old Irishman with a MetroCard, good walking shoes, an empty stomach and a day to fill, what follows seem a little subjective. But whatever. Here’s five ways into New York, five standout experiences among the dozens I encountered on a short visit to the city last week. And, helpfully, five photographs. And no, there’s no particular order (though I’d leave the pizza until after the run). 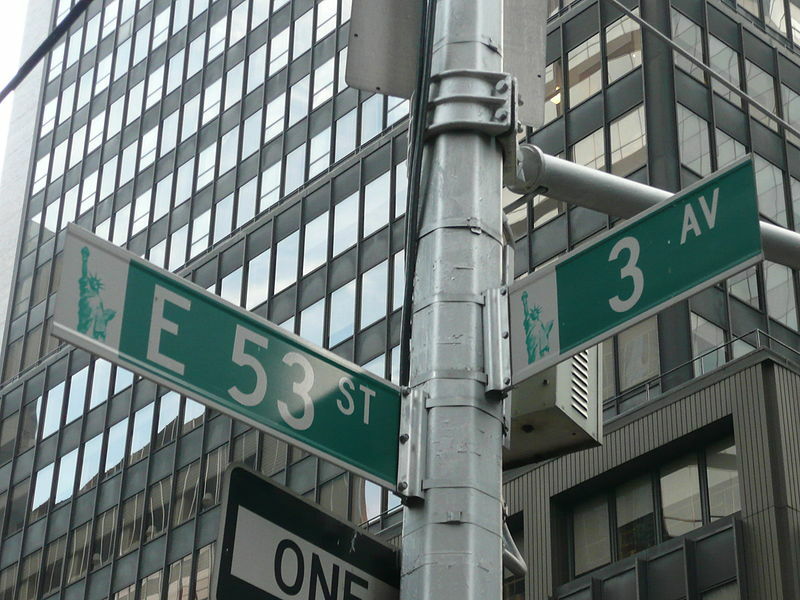 Get out of bed and get to one of the West 59th Street entrances just before the sun rises over the Upper East Side. Join the other early birds and start heading north. 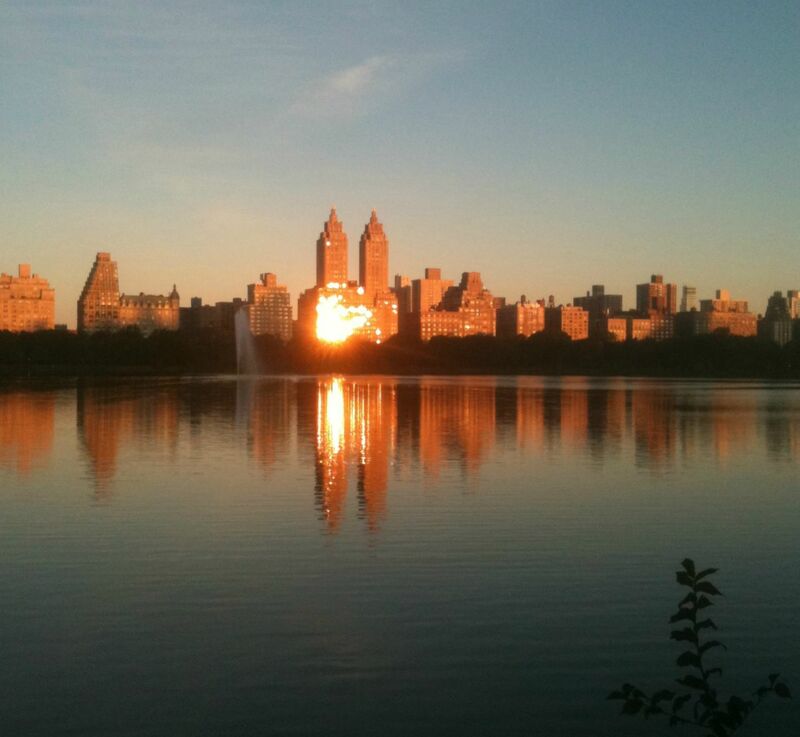 After seven or eight minutes you’ll come upon the Jacqueline Kennedy Onassis Reservoir. It might be oddly-named but its 2.2km add up to one of the world’s finest urban runs – pure shuffling, sweating tranquility in the midst of Manhattan. You may never live in a West Side mansion but you will see the dawn break over one. Done with the run? This is your breakfast. Get it from Artichoke Basille’s on East 14th Street, a tiny pizzeria which offers just four types of pie. 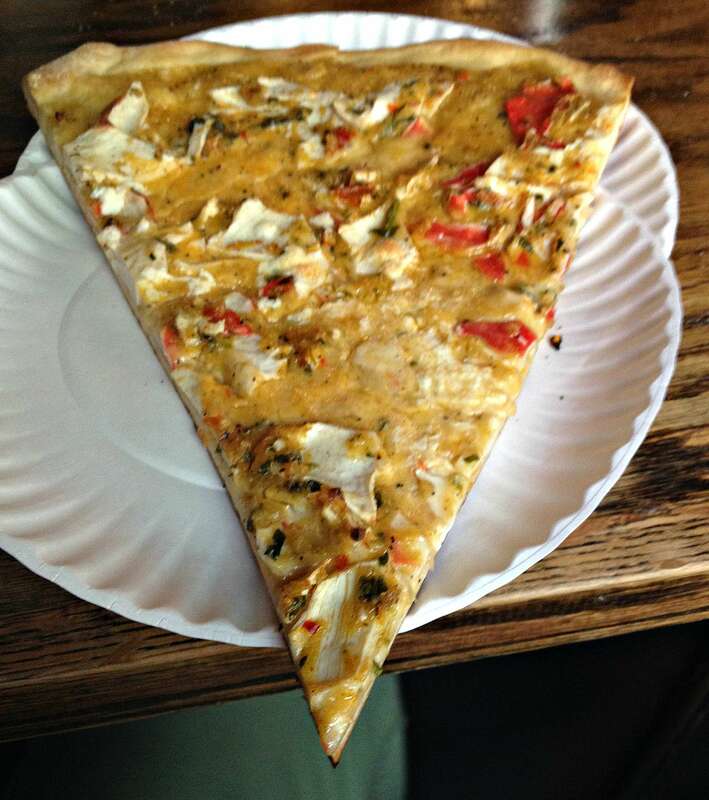 Ignore (if you can) the sicilian or the artichoke and go for the crab. I’m not sure how they make it and, once I bite in, I don’t care. It’s the best slice I’ve had in the city, and best eaten standing shoulder-to-shoulder with other punters on the street outside. Can’t handle pizza at 10am? You’re in the wrong town. 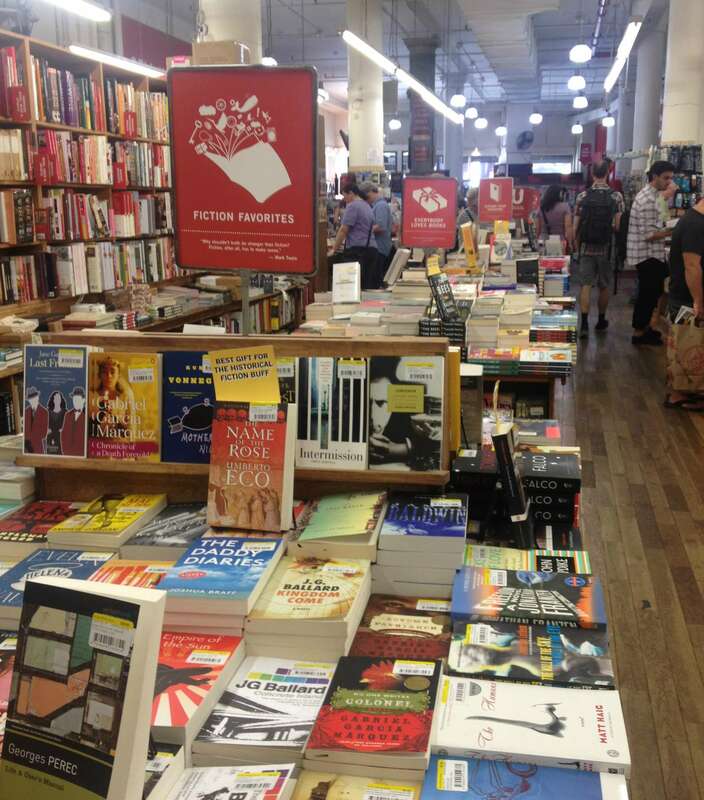 Yes, booksellers still exist – even in Manhattan. Strand Book Store, two blocks south of Union Square, is a bibliophile’s heaven; or hell, as you’ll amass a dozen books in an hour’s browsing, only to leave half of them because your suitcase isn’t big enough. That said, they had me at ’18 miles of books’. 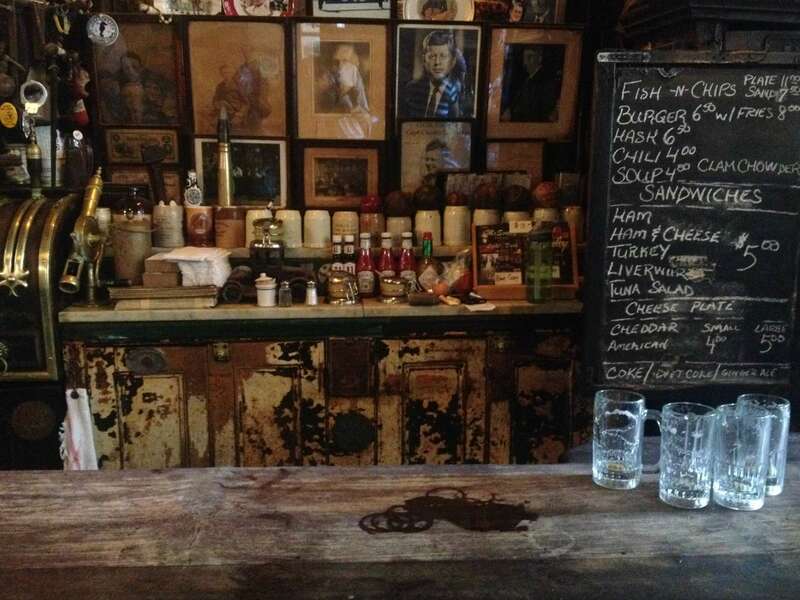 Famous for its policy of ‘Good Ale, Raw Onions and No Ladies’ (until the 1970s at least) McSorley’s is what you expect of an old-school New York boozer – sawdust on the floor, exposed pipes, beer-rings on wooden tables and Irish barmen. Packed at nights (must be the onion-loving ladies) it’s best hit in the early afternoon, when the bar’s half-empty and the sun is shining through the tobacco-stained glass doors. 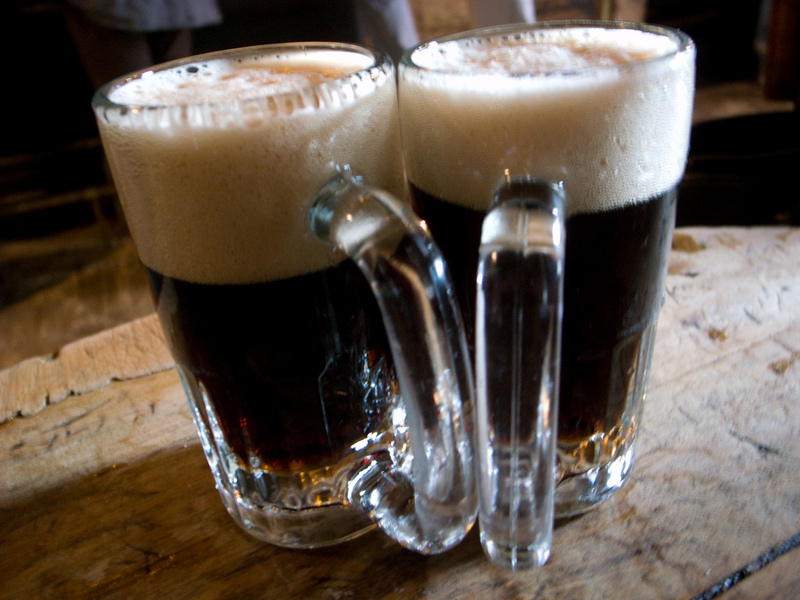 Why does the ale come in two mugs? Who knows? Who cares? New York’s famous for its steakhouses, and Keens is famous among them. This is the land of dark wood, low lights, chest-bursting T-bones, mutton chops and creamed spinach. Time slows, the city (and the world) outside the pipe-strewn roof and picture-clad walls ceases to exist. 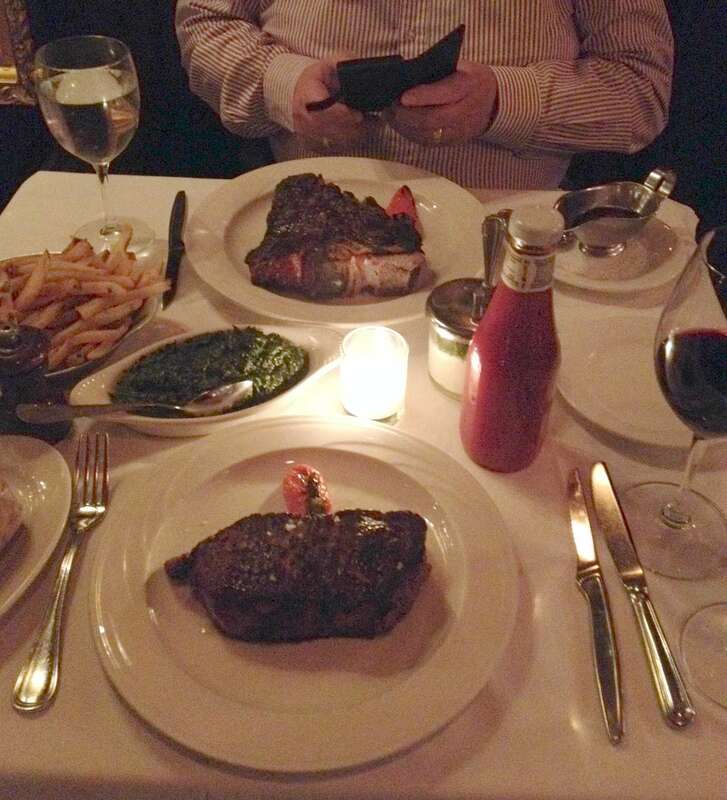 Your New York day ends with you, 16ozs of striploin and a huge cab sav. If you can finish it there, you’ll finish it anywhere. How we’re all tied together. New York is the concentrate of art and commerce and sport and religion and entertainment and finance…It carries on its lapel the unexpungeable odor of the long past, so that no matter where you sit in New York you feel the vibrations of great times and tall deeds. Every time I arrive in New York, stepping up from the bowels of a subway station or out of a yellow taxi, it feels like I’ve stepped into a moving story. E.B. White felt the same. His testament to the city, Here Is New York, was written more than 60 years ago. The vibrations of great times and tall deeds echo still. For me the city has always been more about the former. The hum that runs through its art, its sport, commerce and entertainment is a hook that’s drawn me back many times since I first set foot there, emerging from Penn Station 20 years ago into the humid rush hour on a September afternoon. The vibrations are most clearly manifest in the music of the city: the sound of morning delivery trucks accelerating across junctions, the rattle of subterranean trains heard through ventilation grilles streets above, the rush and push of crowds on cramped sidewalks. This is echoed in some of the recorded music I’ve listened on visits to the city – New York compositions, songs and performances. Ahead of an upcoming visit I’ve put together a dozen of these on a playlist. Today, it seems, is an appropriate one to listen to it. Some of the tracks are, at this stage, part of the fabric of the city itself – Rhapsody In Blue, George Gershwin’s attempt to capture New York’s “vast melting pot”, its “metropolitan madness”, for one. Others are more personal. Phil Chevron’s Thousands Are Sailing depicts a city seen through the eyes of the Irish immigrants of the 1980s – the “desert twilight” of Broadway at dusk, the postcards home from “rooms that daylight never sees”. 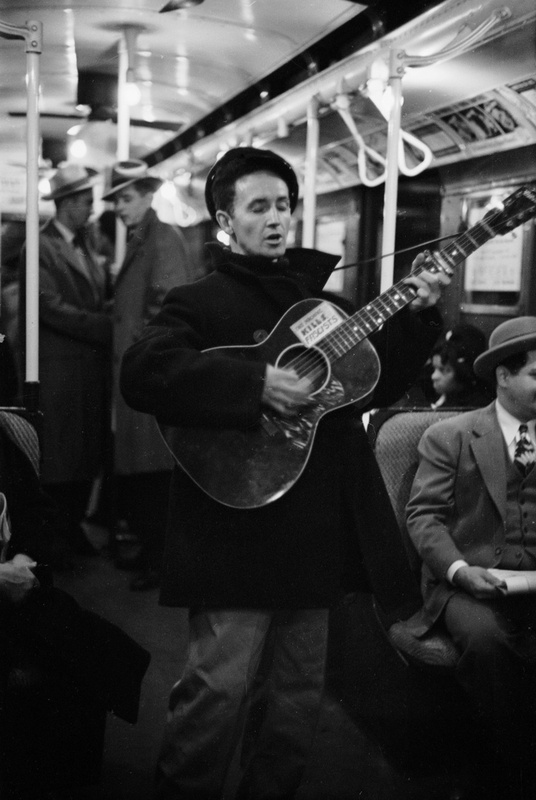 Some are well-known – Woody Guthrie’s anthem This Land Is Your Land opens by namechecking “the New York island”. Others less so. Movement, transit, motion onwards and forward is a regular theme, from Duke Ellington’s Take The “A” Train to – two generations later – Guru’s Transit Ride – two takes on the same subway system. And the street is ever-present: Lou Reed waiting on a corner of Lexington and 125th, Joey Ramone on 53rd and 3rd, a new-in-town Bob Dylan staring up at the Empire State Building. It’s all New York, a place – as White wrote – “like poetry: it compresses all life, all races and breeds, into a small island and adds music and the accompaniment of internal engines”. 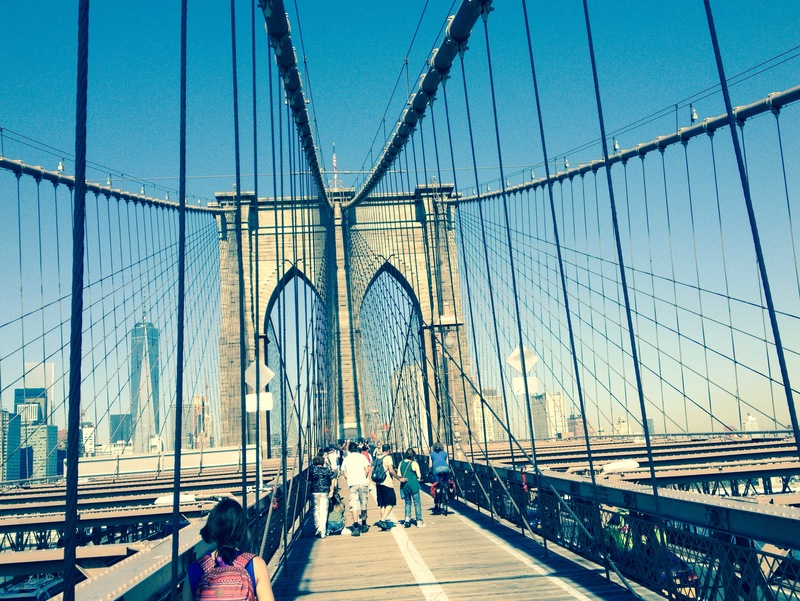 Or one where, as the Beastie Boys put it, there’s no sleep ’til Brooklyn. 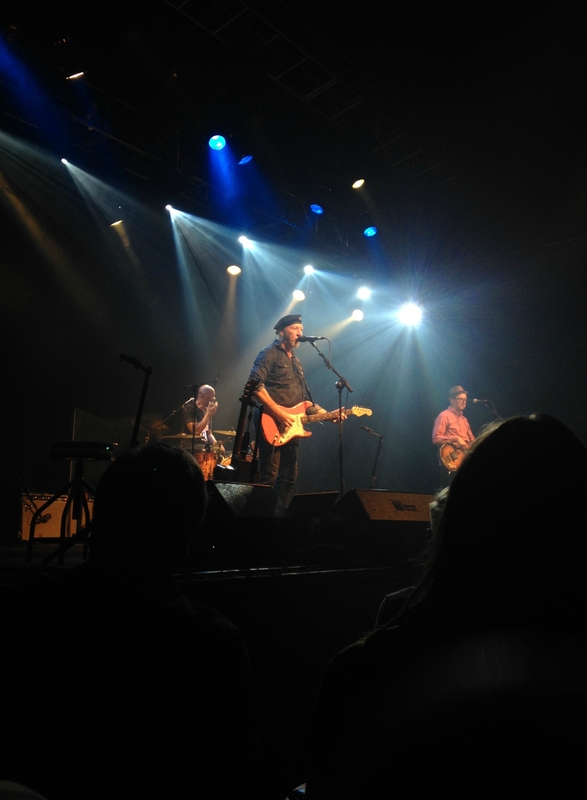 There is a moment at a Richard Thompson show when his guitar-playing virtuosity can put the listener into a trance. Time is suspended, seconds becoming hours, all of which hang on a raised note, the spell broken only when the melody is resolved. It’s heady stuff – up to a point. Is this something that affects the musician? 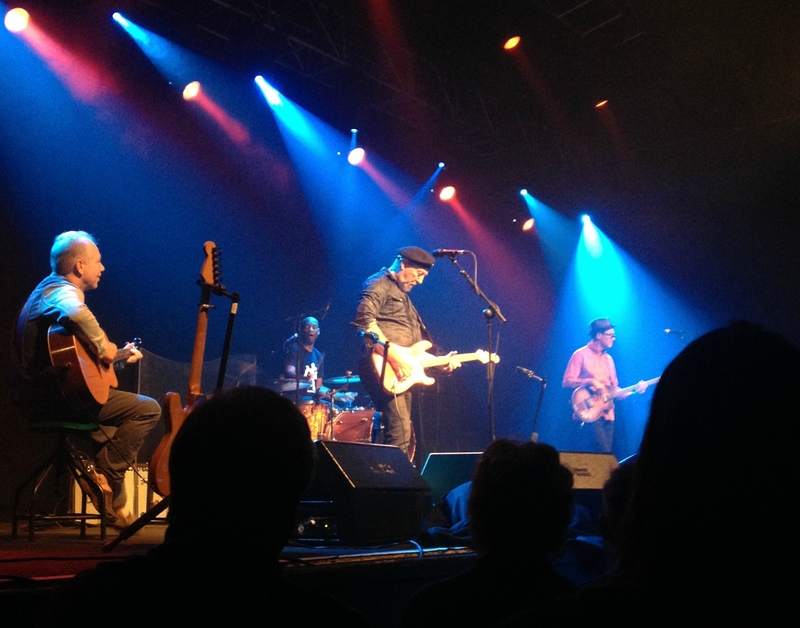 While most treat a two-hour Richard Thompson set as 120 minutes in the presence of a maestro, does the maestro ever find himself drifting away as he fires off another note-perfect rendition of 1952 Vincent Black Lightning? One of the most common complaints people make about their jobs is repetition – the tedium of the same tasks the same way, workday after workday. Why should it be any different if you’re one of the top 20 guitarists of all time, whose performances make grown men sigh? Most of us will change jobs in our lives but rock musicians – of certain stature – can find themselves damned to playing the same songs over and over, for decades. As Thompson commented – after playing Fairport Convention’s Genesis Hall – “that was from 1969” – I thought, ‘you must be a bit tired of it at this stage’. Perhaps such songs are new every time, with a tempo change, a different venue, a bigger audience, the mutable factors that nudge the original just enough to keep it interesting. It’s difficult to know what Thompson, whose stage manner is one of acerbic politeness, makes of it. Unlike some of his generation (Bob Dylan, who I’ve heard mangle plenty of songs over the years) the English folk-rocker seems content to mostly stick to the blueprint. And what a blueprint. The Vicar Street set list included Wall of Death, Shoot Out The Lights and a poignant Al Bowlly’s In Heaven; the show ended with Tear-Stained Letter. The songs and the technique couldn’t be faulted. The virtuosity was spellbinding. And if I worked through my household chores or audience-watched during a couple of the solos, well, my loss. Perhaps it wasn’t you Richard, it was me.